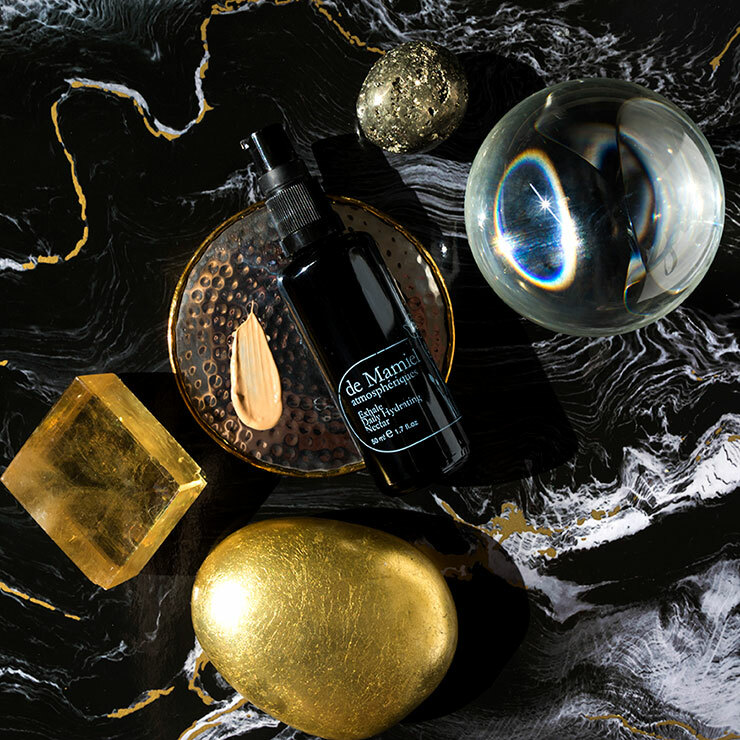 The botanical complex inside this incredible sheer tint, glow-inducing organic moisturizer is unlike any other. A pure blend of ultra-breathable ingredients, high-performance antioxidants, zinc protection and spirit strengthening essential oils, this next generation genius shields your skin from environmental damage and oxidative stress, repairs, hydrates and beautifies with a natural and graceful sheen. 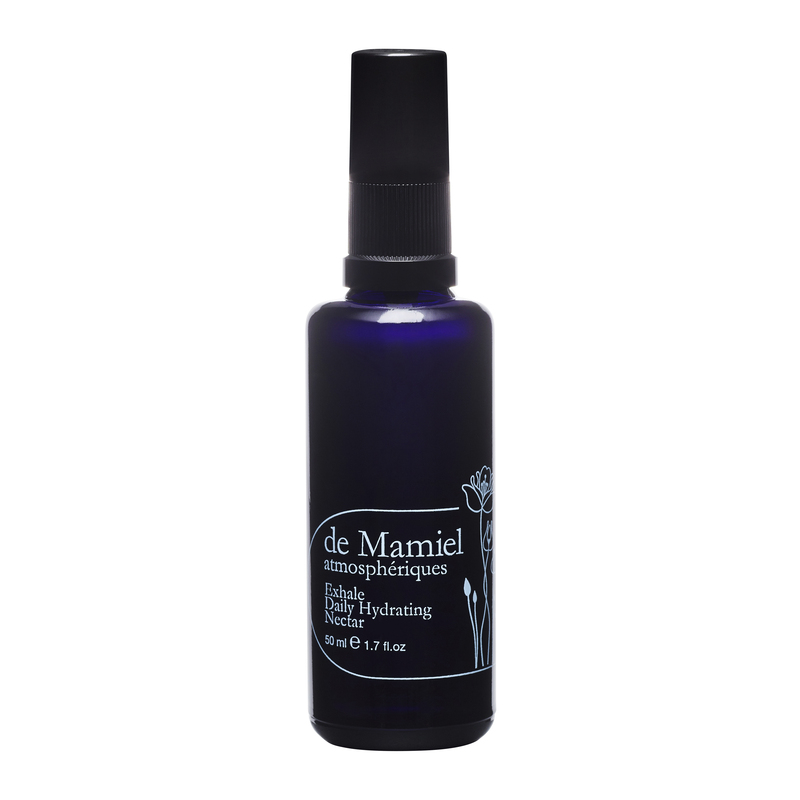 Boost your skin with de Mamiel Exhale Daily Hydrating Nectar's intensely detoxifying botanical complex. Avocado extract works extra hard to bring light back to lacklustre complexions plumping and allowing the skin to breathe deeply, liberating it of all the oxygen-proof layers of pollution. Intensely nourishing, packed with antioxidants, Raspberry Seed oil, Prickly Pear seed oil, Quercetin and Tocopherol, this unique cream is a champion of skin regeneration and long-lasting feeling of hydration. Enriched with heavenly essences of flowers, it strengthens the mind as well and lets you start the day with a deliciously aromatic and empowering ritual. Use daily after cleansing. For oily skin, apply 1-2 pumps over cleansed skin. For combination skin, apply 1-2 pumps over your daily serum. For dry skin, apply 1-2 pumps over moisturized skin. I really enjoyed this when I received in my subscription box. Loved the glowy airbrushed look it provided, smooth texture, and smell. Just can't make myself repurchase and spend the $$. Ouch! I received this in a subscription box. I was able try it four times. I probably could have gotten fifth use if I had scraped the bottle, but I just couldn't force myself to do it. This stuff balled up like crazy no matter how I used it, or what I used it with. It was a mess! There was no way I could put makeup over it, (I actually tried). And to make matters worse, it would continue to ball up as the day went on. I can't imagine how you could get any of skincare or sunscreen benefits if the product just rolls and balls up. The pump on the bottle I received didn't work at all, and there is no way that it was worth the price. I always want to love everything I get in my subscription boxes, but this was a definite FAIL. It's lightweight - which is perfect for the hot Florida days (most of the year!) and smells divine (not too heavily at all!). It feels great on my skin and best of all, I feel like I'm doing my skin a favor putting it on - unlike many of my other sunscreens. I was excited to receive such an expensive product with so much thought behind the formulation. One of my wanted items is an SPF tinted moisturizer. I used this on my face and went on a run midday and felt the sun protection was adequate, but I wasn't out for long in the sun. However, after continued use, the fragrance is just too strong. The texture while smooth is not hydrating on the skin, so I will have to pass on this in the future. So I really was expecting this to be more moisturizing than it is but surprisingly, this makes an awesome primer. It blends with absolutely no white cast, makes my moisturized skin nice and matte, and works perfect under foundation. I actually find myself liking this more than the hero product this month. I certainly will consider purchasing this in the future!